Hello all,I have been reading the forum for some time and have found great info. I am a very new horse owner, and as with all things i am learning the hard way. I have three horses, (forgive my improper descritions) 2 year old palomino (filly? ), yearling paint horse (filly? ), and 2 year old palomino gelding who has the HYPP trait, i have not had him tested for the nn/n? result. Just wanted to say hi and thank everyone for all i have learned so far...just beginning i am sure. My horses are not show horses/race horses/i consider them big pets, but do have a realization that they are big and can and have hurt me, but i am figuring that out too. all for now. HI 34me, Welcome to the forum. Lots of nice folks here, some good advice and also some fun. How long have you had your horses? Do you have some access to experienced folks in you area to help you along? Lot's of work and fun ahead with 3 two year olds to train. We ahve three two year olds that we will be starting this year as well. Good luck and let us know your questions and progress. Sounds like you're going to be busy training your horses. Filly is the correct term, btw! A filly is a filly till she turns 4 then she's a mare. We love pictures. HINT HINT! We have had the horses for about 1 year. My 2 year old filly had a bad leg injury over the summer (that is healed now) so we have not ridden her, just do some grooming, leading, picking up feet. I bought some books but they were a little over my head, so i bought horses for dummies (ha). We do have lots of people around who will work with us (for $$). I live in Oklahama so there are lots of horse people here, found our vet two blocks from our place, still have not found a farrier i like but am still trying. you will learn alot with the crowd here. Remember to use common sense when training your horses, take it in baby steps. Sometimes a well experienced horse can be your best teacher, it also makes learning about horses fun. I am also new to horses within the last couple of years, am training a coming 2 year old filly, but recently bought a been there done that horse who is very kind and forgiving of this greenie. I have learned alot here, and am looking forward to more. I had an 8 year old mare before i got the gelding, and she was too smart for me, i could not make her do anything, i think she knew she had her bluff in on me. so i "traded" her for the gelding, and he is a sweetie, really calm, and is comfortable with his place in the crowd of the two other girls. i do worry that i am not doing something or doing something i should not. i see new things they do everyday. today they are all out in the pasture pawing the ground?? not sure what that means? Howdy! Welcome to the board! Welcome to the Board, 34me. It sounds like you're off to a good start. Getting your young horses used to being handled is important. There are many great knowledgeable members here who can lend you great advice on a variety of subjects. Look forward to hearing more from you. I am in Oklahoma, and will post some pictures as soon as i figure out how. �	Now go to your post on the forum and put the curser where you want the picture. �	Right click, PASTE and you are done. �	Good idea to use preview on forum to check size of the picture. If it is too large go back to photobucket and use the edit function to reduce the size. What part of OK are you in, 34me? I have a very good friend who lives in Soper, near the TX border, and is an excellent trainer. He specializes in competitive trail and endurance horses, but is an old hand at training horses in general... very knowledgeable. Welcome to , by the way . Welcome! What beautiful horses! They are really good shape for just being babies! You have a fun summer ahead of you! My first really good horse was a nice Skipper W bred palomino gelding. I bought him as a green two year old and had him until he died at age 30 1/2 years! Now that was a GOOD horse! I am lucky enough to have found 2 nice horses to take his place. (See former topics on HAA!) Enjoy your babies! Nice horses. Love the colour and condition. Beautiful and healthy horses. Thanks for sharing the pics. Thanks, but they dont quite look like that now, they are a little dirty and have a lot heavier coat, they look like furry bears. 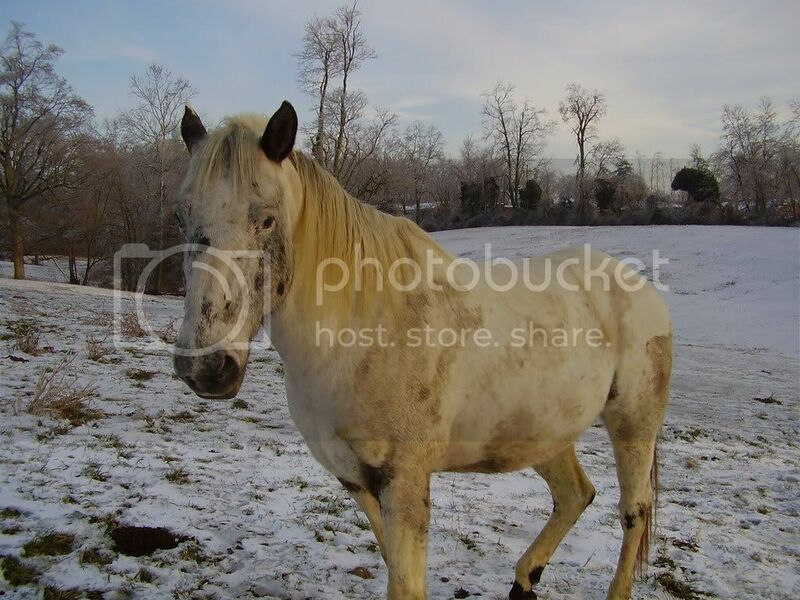 Oh, if you want to see dirty; here's a pic of Hi-Grey from last winter (looks similar this winter). Nice pix!! Gorgeous horses and a gorgeous place to ride. That you riding? "I'm a man. I can change. If I have to. I guess." no that is my hubby on our gelding whiskey. i am recovering from rotator cuff surgery, so no riding for a few more weeks, but too muddy anyway. Gorgeous place to ride is our front yard!! We are blessed to have 16 pretty acres for our horses and our house too.